For more than 15 years, Leaper is specialized in creating various backpacks to satisfy every customer' s need. 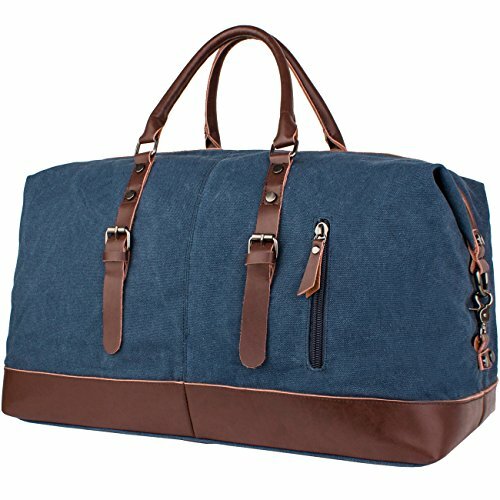 The travel bag is a reliable, well built, classically designed weekender and the construction is fantastic. Material: High quality heavy duty and durable canvas + PU leather trim stitching handcraft, bottom Rivets + Smooth Zipper. NOTE: We have updated the tag, two tags are randomly sent. We appreciate your understanding. Size: 54cm*40cm*23cm(L*H*D)/21.2''*15.6''*9''(L*H*D). Large Capacity: 55L. Large capacity, can be used as a carry-on flight bag or a weekend bag. Construction: 2 outside pockets can put passport, cell phone and other small stuff for easy touch; 2 inside zippered pockets for confidentials; the main compartment has enough room to hold several clothes and traveling necessities. Fashion casual life style, General use for Female, Male, Family. Great holdall tote handbag used in the weekend travel, daily travel, short business travel. Convenient and cool!